A SCOTTISH brewery has won a contract to sell two of its ales in supermarkets across the whole of the UK. Traditional Scottish Ales Co, a brewery from Throsk in Stirling, has signed a deal with Aldi to sell the beers in all of its 462 UK stores. 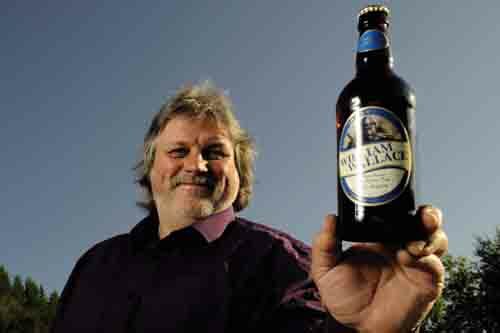 The company was approached by the supermarket to sell the two ales, William Wallace Export and Rabbie Burns Blonde, which were previously only available to buy in Scotland. Due to the popularity of the ales ahead of Burns Night, there has been a surge in production and temporary staff have been drafted in to help meet demand. The William Wallace Export is a dark ale with a slightly sweet taste with a light hint of caramel. Rabbie Burns Blonde Beer, which is only made in limited quantities each year to celebrate Burns Night, is a robust ale with complex flavours of liquorice and dark chocolate. The beer is now on sale as a special buy ahead of Burns Night on Friday 25 January. Graham Coull, co-owner of Traditional Scottish Ales Co, said: “The deal is a big boost for us and will help us to continue to grow our company. The two beers are on sale for £1.39 each for a 500ml bottle. Arran Blonde, Arran Dark and Arran Sunset and in Booths stores we have our Arran Red Squirrel, Arran Clyde Puffer and Arran Fireside.